What is Nigerian candidate Buhari really doing in London? Since last weekend, leading Nigerian presidential challenger Muhammadu Buhari has been in London, even though he’s waging a spirited fight in what could easily be the most contested election since the return of civilian rule in 1999. So what was he doing spending a week in the United Kingdom, over 4,200 miles away? Buhari, the candidate of the opposition All Progressives Congress (APC), who’s waging his fourth presidential campaign since 2003, was also Nigeria’s military head of state between December 1983 and August 1985 has been in the United Kingdom, waging a charm campaign that seems largely geared at allaying fears of Western government, specifically those of the United Kingdom and the United States, that a Buhari victory in Nigeria’s delayed March 28 election would represent a backtrack for democracy in Africa’s most-populous country and its largest economy. He appeared at the leading think tank, Chatham House, in London on Thursday. Though it was clear that his audience was Western policymakers and not Nigerian voters, Buhari’s remarks, at least at face value, were humble, measured and thoughtful, and he committed himself to democracy, not only in Nigeria but throughout Africa, expressing hope that a flourishing, democratic Nigeria could trigger a wave of consolidated democratization throughout Africa. Buhari’s victory could end, after 16 years, the dominance of the governing People’s Democratic Party (PDP) in Nigeria. He spoke, sometimes eloquently, about how democratic elections alone are not enough to entrench democratic traditions in Africa. As you all know, Nigeria’s fourth republic is in its 16th year, and this election will be the fifth in a row. This is a major sign of progress for us, given that our first republic lasted three years and five months. The second republic ended after four years and two months. And the third republic was a stillbirth. That last bit elicited laughter from the audience, because it was Buhari who led the military coup that brought the third Nigerian republic to its end three decades ago. Let me close this discussion on a personal note. I have heard and read references to me as a former dictator in many respected British newspapers, including the well-regarded Economist. Let me say, without sounding defensive, that dictatorship was military rule. Though some are less dictatorial than others, I take responsibility for whatever happened on my government watch. I cannot change to the past, but I can change the present and the future. So before you is a former military ruler and a converted democrat. Frankly, that’s a lot more apologetic than South Korean president Park Guen-hye, who only reluctantly expressed regret for the excesses of her father, South Korea’s military dictator for nearly two decades. Indian prime minister Narendra Modi hasn’t apologized at all for more than 1,000 Muslim killed in riots that took place in Gujarat in 2002, when Modi’s state government was accused of encouraging Hindus to take vigilante action. Though Nigeria’s sporadic military rule firmly ended in 1999, its first ‘civilian’ president, Olusegun Obasanjo, was a Nigerian army general and his administration, which ended in 2007, found many top roles for Obasanjo’s former military pals. No one today could call Buhari, three decades after his own role in toppling an elected Nigerian president, a figure who wants to restore military rule. Ironically, perhaps, Nigeria’s military brass today generally favors the incumbent, Goodluck Jonathan, and Buhari, a northern Muslim with a reputation as something of an ascetic who tried to reduce corruption in the 1980s, could upset the cozy links between Nigerian business and government. But Western governments, which have worked closely with Jonathan since he assumed the presidency in 2010, have been wary of Buhari, questioning what his checkered past would mean in the event that he defeats Jonathan — a result that seems quite possible, according to ground reports and to polls. 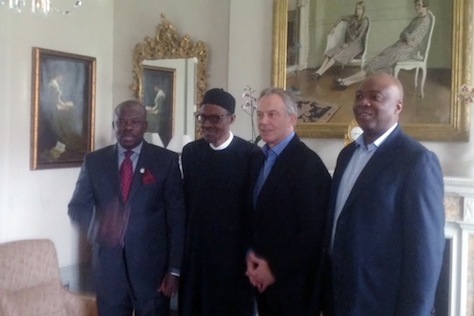 There are two explanations for why Buhari, who also met quietly with former British prime minister Tony Blair (pictured above) over the weekend, would spend such a long time abroad in the heart of Nigeria’s toughest election in 16 years. The first is that he’s so secure that he will win the election, he can spare a week away to buttress support in the international community. There will still be time for Buhari to campaign — the election isn’t until March 28 and, if it’s incredibly close, may be forced to a runoff on April 11. The second is that Buhari is seriously worried that Jonathan (and/or the Nigerian army) will steal the election. That’s not an idle concern, given past practice of vote-buying and other forms of fraud. To the extent that Buhari can reassure the UK and US governments that he’s not a dictator-in-waiting, it will be helpful on election day, which has already been delayed by six weeks over security concerns. Perhaps unexpectedly, Buhari had tough talk for the northeastern Islamist Boko Haram insurgency, and he expressed shame that Nigeria’s neighbors have been forced to come to its rescue. He promised that if elected, the world will have no cause to worry about Nigeria, which would return to its stabilizing role in the west Africa region. We will be tough on terrorism and tough on its root causes by initiating a comprehensive economic development, promoting infrastructural development, job creation, agriculture and industry in the affected areas. Throughout Buhari’s trip, Jonathan supporters have argued that Buhari has been in the United Kingdom to receive medical treatment, arguing that all of his appearances have been photoshopped. Chief among those has been Ayo Fayose, the governor of Ekiti state in southwestern Nigeria. Notwithstanding Fayose’s campaign to the contrary, there’s no indication that the 72-year-old Buhari is in poor health. The issue has special resonance in Nigeria, where Umaru Musa Yar’Adua, elected in 2007, died in office in 2010. His incapacitation and death precipitated a political crisis. Although Jonathan, his vice president, ultimately came to power, Jonathan’s decision to run for president in 2011 disrupted the unspoken agreement for the Nigerian presidency to alternate between the Muslim north and the Christian south. So rumors of Buhari’s infirmity are particularly sensitive, especially among his northern supporters, who feel that Jonathan elbowed their region out of power four years ago. Previous PostNitish Kumar returns to front-line Indian politicsNext PostVideo of the day: Brazil needs a ‘Straight Pride’?